The world's largest airline told investors last week that Q4 unit revenue growth came in at the bottom of its guidance range. Delta Air Lines (NYSE:DAL) stock plunged in early January, after the No. 2 U.S. airline cut its unit revenue guidance for the second time in the span of a month. Delta announced that revenue per available seat mile (RASM) was on track to rise 3% in the fourth quarter, compared with its previous forecast for a 3.5% gain and its initial projection that RASM would increase 3% to 5%. The fact that adjusted earnings per share will come in near the high end of Delta's guidance range didn't seem to matter to investors. On Thursday, it was American Airlines' (NASDAQ:AAL) turn to slash its RASM forecast for the fourth quarter. To make matters worse, the world's largest airline also trimmed its EPS outlook. Nevertheless, investors may be underestimating American Airlines' future prospects. Back in October, American Airlines projected that RASM would rise 1.5% to 3.5% in the fourth quarter. That would have been roughly in line with the 2.7% RASM growth it achieved in the first three quarters of the year. Like Delta, American now expects RASM to come in at the bottom of its initial guidance range (i.e., up 1.5%). Management said that the guidance reduction was "due primarily to a lower than anticipated improvement over a strong fourth quarter of 2017 in the domestic market." This statement was similar to the language Delta used to explain its unit revenue miss. American Airlines still expects to report roughly flat nonfuel unit costs for the fourth quarter. Meanwhile, it reduced its Q4 fuel cost estimate by $0.08 per gallon. That should have offset most of the carrier's RASM shortfall. Nevertheless, American Airlines reduced its adjusted EPS forecast to a range of $4.40 to $4.60 from its prior estimate of $4.50 to $5. This caused American Airlines stock to plunge as much as 11% on Thursday, before recovering to end the day down 4% and within striking distance of its 52-week low. Just based on the headline numbers, it may seem that American Airlines' unit revenue growth is on the verge of stalling out. That would be bad news for investors. However, American Airlines was facing an especially tough year-over-year RASM comparison last quarter. In the fourth quarter of 2017, unit revenue surged 5.6%. By contrast, American's RASM grew at less than half that rate in 2018. This suggests that even if underlying revenue trends stay constant, American Airlines' unit revenue performance should improve in 2019. Furthermore, American Airlines is set to expand at Dallas-Fort Worth International Airport -- one of its most profitable hubs -- later this year. The carrier will gain access to 15 additional gates, allowing it to add up to 100 extra peak-day flights over the summer. This will enable it to serve more small cities, which tend to generate disproportionately high unit revenue. The first new routes will begin in March, with others phasing in between then and June. American Airlines will get similar opportunities to add capacity in Charlotte, North Carolina, and Washington, D.C. in 2020 and 2021, respectively. As of mid-2018, those three hubs had average pre-tax margins 5.6 percentage points higher than American's systemwide average. Shifting capacity from less-lucrative hubs to Dallas-Fort Worth, Charlotte, and Washington, D.C. could thus have a meaningful positive impact on unit revenue and profitability. As long as fuel prices remain below 2018 levels, American Airlines won't need to do better than low-single-digit RASM growth this year. Assuming an average jet fuel price of $2.10 to $2.15 per gallon -- above recent levels -- a 2% to 3% RASM gain could send EPS rocketing past the $6 mark in 2019. 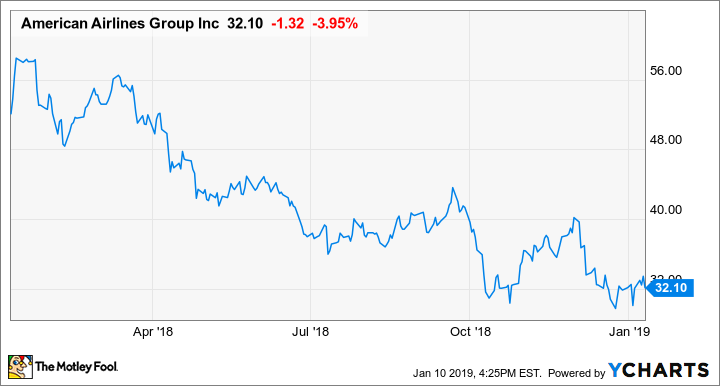 American Airlines stock certainly comes with risks, mainly because the company is burdened by about $25 billion of debt and capital lease liabilities. However, American's investments of the past few years should start to pay off in 2019. And with its capital expenditures set to moderate dramatically beginning in 2020, American Airlines will be able to start chipping away at its debt load, giving investors more comfort over its financial stability -- and potentially driving a rebound in its stock price.